The church construction, laid on Dominican foundations, was started in 1261 to keep the holy thorn relic, that was donated by Louis IX, King of France, to Vicenza’s bishop, Beato Bartolomeo da Breganze. The interiors are in Gothic style; the presbytery was made by Lorenzo da Bologna in the second half of the fifteenth century, and it has many and important paintings and sculptures. Among these works, there are Giovanni Bellini masterpiece “The Baptism of Christ”, located on Garzadori altar, attributed to Rocco da Vicenza, and Paolo Veronese “Adoration of the Magi”. Also, there are Lorenzo Veneziano and Marcello Frogolino “Madonna of the Stars”, Bartolomeo Montagna great altarpiece “Mary Magdalene and Saints”, and Giambattista Pittoni “Madonna with Child and Saints”. In the church apse, there is the remarkable wooden choir, carved and inlaid, made by Pier Antonio dell’Abate. Among the most ancient decorations, there are Michelino Besozzo frescos in the Thiene Chapel, dated back to the early fifteenth century, clear examples of the most updated international gothic style. To allow visitors to gain a better understanding the intense work done to renovate this monument is possible to get a look at the illustrative boards located in the crypt. The church of Santa Corona is provided with a free digital guide, available for smartphones and tablets, both in Italian and in English. 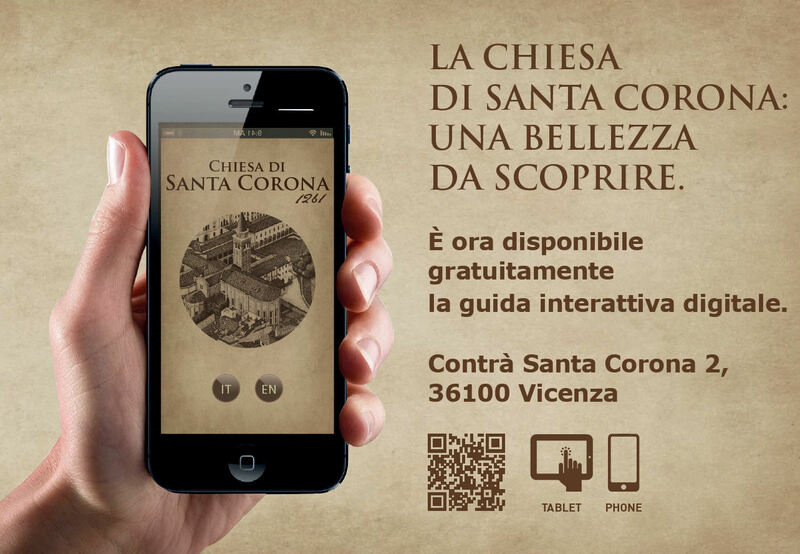 Just scan the QR code at the church entrance or download the digital guide app on Apple store or Play store, or connect to http://www.chiesadisantacorona.vicenza.it/. Santa Corona’s church digital guide and the new didactic signage were made thanks to the contribution of the foundation Giuseppe Roi. It is possible to inquire about hosting appropriate events in Santa Corona’s church. For more information, please contact the Events Office, Culture section, development promotion and museums. (tel. 0444222121).